Will Obama See His Shadow in Punxsutawney? Let the speculation begin... and promptly end! Today the White House Office of Media Affairs sent us a single but oh-so-compelling sentence regarding the president's whereabouts next week: "On Wednesday, February 2, President Obama will travel to central Pennsylvania." The White House further teases us with, "More details will be released as they become available." Oh, snap, White House, leaving us hanging like that! So let's break it down: Central Pennsylvania. Feb. 2. 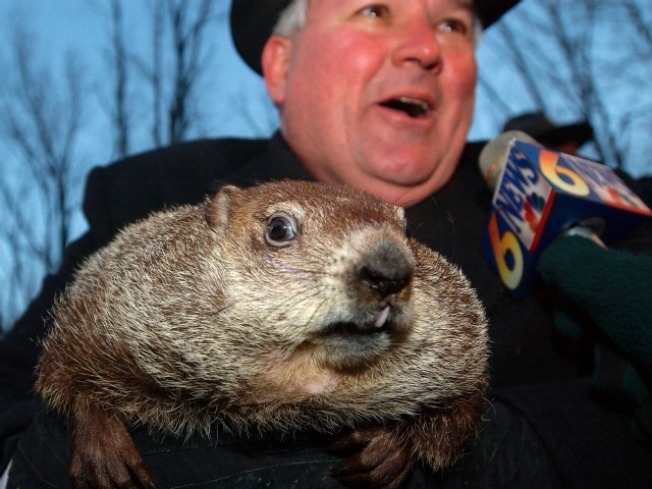 What could possibly be happening in Central Pennsylvania on Groundhog Day? Maybe... a briefing with Punxsutawney Phil? Alas, Penn State is already advertising a planned presidential visit that day. "The president will focus on the importance of work being done at the Energy Innovation Hub at the Philadelphia Navy Yard," the university said in a release. Sure, energy innovation is important... but it's no groundhog. Maybe Obama will still find time to swing by Punxsutawney. If that's the case, we suggest President Obama read up on those Pennsylvanians' wacky lore. "There has only been one Punxsutawney Phil. He has been making predictions for over 120 years! Punxsutawney Phil gets his longevity from drinking the "elixir of life," a secret recipe. Phil takes one sip every summer at the Groundhog Picnic and it magically gives him seven more years of life." Um... sure. Maybe it'll be better to stick to things that make sense, like global industry and regional economic development agencies.